For a few extra Christmas dollars I'm making bracelets out of parachute cord and selling them for $5. 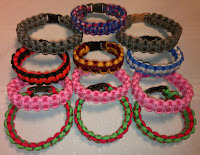 They go by the names Paracord, Survival, Cobra Stick and rope bracelets. The reason for survival bracelet, is when it is disassembled, a large one may have as much as 10 feet of cord you can use. You know I never ever make too much money at these kinds of things, because I teach people how to do it! That's okay though. I learned this knot a few years ago from ITS Tactical (he does some really beautiful stuff) but today I'd like to especially highlight Animated Knots by Grog. Search for Cobra Knot or click here. A great webpage with some neat links and animations. Also checkout some of the phone apps they highlight. The reason I'm partial today to Grog, is that he is quick to reference the source of all sources, the Knotter's Bible and my favorite book, The Ashley Book of Knots, written in 1944. This book is worth a write-up all of its own. My dad gave me a copy of this $50+ gem when I was 14 and I've loved tying ever since. Here's another great source, that shows step-by-step how to make a bracelet. Great job Wilderness Wiki contributors! So for fun, money or carrying on the tradition of knot tying with your children, grab some rope and learn a new knot! If you want parachute cord, check out your local Army/Navy store first or google it. I happen to love the Supply Captain. From One Kid to Another, "My First Deer Hunt"